One of the most famous sites in Hinduism, the Pashupatinath Temple in Nepal, has experienced a significant break with tradition. Its prayers always used to be led by high caste, Brahmin priests recruited from south India. But now they have been replaced by local priests - ending centuries of tradition and long-held rituals. The development can be seen as a reflection of wider changes that have swept Nepal over the past year. The Pashupatinath Temple sits on a sacred river on the edge of Kathmandu. The complex rises up from the bank amid a mass of pagoda-style buildings. Pilgrims and holy men climb the steps between them. 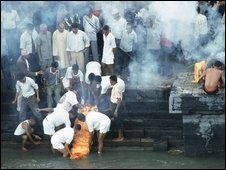 They perform prayers and make offerings to the gods as smoke from funeral pyres rises into the air. The temple moves to ancient rhythms. And one of its many traditions has been to recruit its priests from Brahmins from far-away south India. No more though. For the first time in nearly 250 years, the south Indians have been replaced by local, Nepali priests. It used to be that the temple authorities would appoint its priests in conjunction with the king - and he was always happy to maintain the link with south India. But the new power in Nepal is the Maoist party. And earlier this year, it swept away the monarchy. This made the Maoist prime minister a patron of the temple. Although the government is saying nothing, it is widely believed that the decision to employ local priests is a result of the new, Maoist influence. The fiercely secular communists would have few qualms about dispensing with the services of the south Indian Brahmins. And the Maoists would be aware that there has long been some resentment among ordinary Nepalis that foreigners have always presided over the temple's rituals. This has been a year of huge and historic change in Nepal. The Maoists have been ready to set aside some very deeply rooted traditions, and now that mood seems to have made itself felt even within the walls of the famous old temple.